MISSION, KS--(Marketwired - Apr 1, 2016) - (Family Features) Whether you're looking to scale back on animal products or simply want to add some variety to your cooking repertoire, soy may be your solution. Soy is the only plant with protein comparable to meat, eggs and dairy, and it provides health benefits, including heart, muscle and bone strength. It is also the only protein recognized by the FDA for its role in reducing cholesterol and risk of heart disease. If you're uncertain how to cook with soy, you may be surprised by the diverse ways you can incorporate this nutrient-rich food into your meals and snacks. As these recipes show, it's easy to cook with soy throughout the day, from fluffy breakfast pancakes to a fresh take on hummus or a delicious tofu dinner loaded with flavor. In addition to the nutrition benefits and versatility, soy uses fewer natural resources, such as water and land, than any other protein source, so you can feel good about making it a star ingredient in your kitchen. Find more recipes and inspiring ideas for cooking with soy at soyfoods.org. Tofu: extra-firm replaces meat protein in recipes such as grilled kabobs and sandwiches, or use soft or silken in place of mayonnaise and sour cream in creamy dishes, such as soups and dips. Edamame: serve these green soybeans in the pod for an appetizer or add to dishes, such as chili or stir-fry, for protein-packed flavor and texture. Soymilk: ideal for beverages such as smoothies and lattes, over cereal and in cooked dishes, such as puddings or custards. Dairy alternatives: a wide range of dairy-free products are available, including soy-based "yogurt," "cheese" and frozen desserts. Soy crumbles: perfect for chili, spaghetti sauce and tacos, this "veggie ground" contains 75 percent less fat than ground beef. Soy flour: improves taste and texture and elevates the nutrition profile when mixed with wheat flour. Heat large, non-stick skillet over medium heat; brush with remaining oil. Pour 1/4 cup batter per pancake into skillet, leaving space between each pancake. 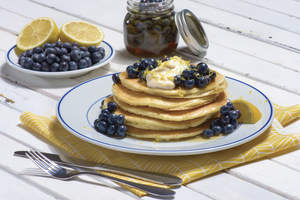 Add 1 tablespoon blueberries to each pancake. Nutrition information per serving: 260 calories; 6 g protein; 34 g carbohydrate; 2 g dietary fiber; 11 g fat (1 g saturated fat); 0 mg cholesterol; 230 mg sodium. In food processor, puree edamame, oil, lemon juice, garlic, cumin and salt for 30 seconds, scraping sides twice, until almost smooth. Cover and refrigerate until ready to serve. Serving tips: Serve with pita triangles, crackers, baguette or raw vegetables. Nutrition information per serving: 60 calories; 2 g protein; 3 g carbohydrate; 1 g dietary fiber; 5 g fat (0 g saturated fat); 0 mg cholesterol; 90 mg sodium. Slice tofu into 1/2-inch slices and set aside. In bowl, whisk together vinegar, olive oil, salt and pepper. Pour over tofu and marinate for 20 minutes. Nutrition information per serving: 290 calories; 12 g protein; 18 g carbohydrate; 7 g dietary fiber; 15 g fat (2.5 g saturated fat); 0 mg cholesterol; 160 mg sodium.